A mix of clouds and sun. High 66F. Winds W at 10 to 20 mph..
Whitley Smith, an amateur radio enthusiast, has found a way to incorporate his hobby into many of his other interests. "I have one in the truck and travel trailer," Smith said. "I have a nifty device to put an antenna on my camping trailer - it's part of my life." While camping in remote places, Smith can set up a station and communicate with friends back in Hermiston and Pendleton, as well as other places, through a repeater; a person who listens for a transmission and re-transmits it. Smith also uses his ham radio as a weather spotter for the National Weather Service. "It's another fun aspect and you don't have to be amateur radio operator to be a weather spotter," Smith said. "But I can jump in my truck with a portable unit and I can spot." Getting involved as a amateur radio operator was a natural progression with Smith's other interests. "I was always tinkering a little on electronics. Actually, my dad became a ham and his interest spurred mine," Smith said. "Ham" is another word for amateur radio operator. It was coined after amateur radio operators in the early days competed for time and signals supremacy in each other's receivers with other radio operators at government stations, ships and coastal stations. Often, the amateur radio operators could effectively jam other operations with their powerful stations. Frustrated operators referred to the amateur "interference" as hams for hogging up the time. Despite its roots, the name stuck, and many amateur radio enthusiasts wore the name with pride. Smith said his father, Howard, had always been somewhat of an introvert, while his mother, Ernistine, was an extrovert. "Once he got into amateur radio, he got more and more outgoing," Smith said of his father. Smith's parents traveled to functions with others who had an interest in amateur radio. Smith has followed suit in that respect. His wife, Brenda, has attended some conventions, swap meets and tailgate parties with Whitley. Although he wasn't personally involved in helping with communication during the storms on the Oregon and Washington coasts earlier this month, Smith said other amateur radio operators played a key role in helping during the days following the disaster. "We (ham radio operators) were very busy during the recent storm," Smith said. "The governor issued a disaster effort and it really was a disaster. A lot of us helped out with communications during the disaster." Smith participates in what's called traffic net. It helps in training hams to communicate from one place to another. "These nets are important because they provide experience for hams in the event of a disaster," Smith said. "The only communication that was viable during the disaster in New Orleans was amateur radio - they saved a lot of lives." 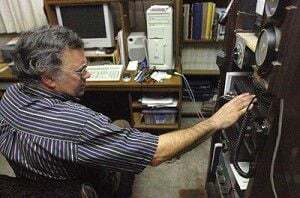 Smith said during the Sept. 11 tragedy, amateur radio was key, especially since cell towers were situated on top of the World Trade Center, rendering cellular phones useless. "Trying to find an individual in a disaster is incredibly hard, but for that person to get a message to you wouldn't be a hard thing - that wouldn't be difficult," Smith explained. Smith enjoys assisting with coordinating communication efforts during local events, including the Umatilla County Fair Parade, WalkAmerica and the March of Dimes fundraising walk. He has also assisted with bike-a-thons and Jamboree On The Air, a way to introduce youths to using amateur radios. "My hobby's been educational, interesting and beneficial," Smith said.